MOTO GUZZI has just unveiled three new bikes at Eicma – two versions of its brand new V9 platform – the V9 Roamer and V9 Bobber, and the Stornello - a scrambler interpretation of its existing V7 II. It's also confirmed that the MGX-21 Flying Fortress, originally shown as a concept in 2014, will be part of its 2016 range. The V9 is the latest addition to the Guzzi range and comes in two variants – the V9 Roamer and V9 Bobber. The Roamer is being pitched as the conventional version of the V9, while the Bobber ‘represents the darker and more sporty soul of Moto Guzzi.’ With its black bodywork, the V9 Bobber is a moodiest looking of the new V9. The bikes have a claimed weight of 200kg and both comes with ABS and adjustable traction control (which can be disabled). Both also include an immobilizer and USB port and a single, circular dash. Moto Guzzi says it will be offering a range of accessories for the bikes, including a system to connect the bike to the rider’s smartphone and options to personalize it according to their tastes. The Stornello is a scrambler version of the existing V7 II. It’s powered by the same 744cc V-twin engine, but with a new and better clutch and six-speed gearbox. Guzzi claims the overall weight for the Stornello is 186kg. 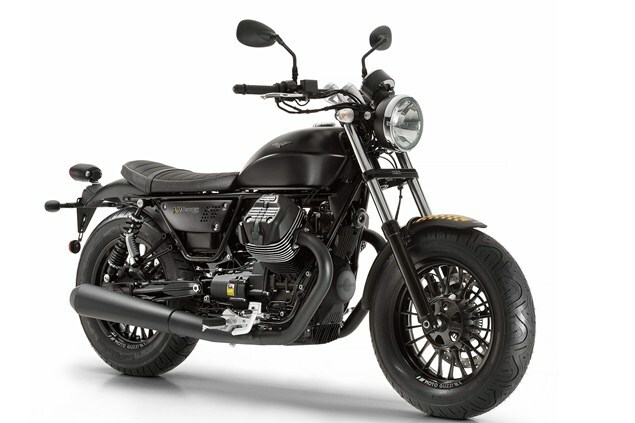 Moto Guzzi’s is pitching the Stornello as an example of its ability to build ‘true factory specials’ and as such, it’s been given a few trick bits including an Arrow exhaust, wire-spoked wheels with ‘off-road’ tyres. It’s also got aluminium mudguards, footpegs and injector bodies, plus three sets of number plate holders. Technicallly, its standard factory equipment includes ABS and traction control. At the time of writing, there’s no more technical information or pricing information for any of the new models, but we’ll let you know as soon as we find out. Moto Guzzi has also announced that the MGX-21 concept it unveiled at Eicma last year will be put into production under the name MGX-21 Flying Fortress. It’s essentially a customized bagger version of Guzzi’s existing California, powered by the firm’s 1380c air-cooled V-twin engine which puts out a claimed 89 lb/ft torque, transmitted to the rear wheel to using a cardan final drive. It puts out a. The production model also gets a ride-by-wire throttle, ABS, adjustable traction control and cruise control, and still retains the 21 inch front wheel with carbon covering, as seen on the concept version. We'll add pictures of the production version MGX-21 once they're available.